Jamie M. Gold (born August 25 1969) is an American television producer, a talent agent, and poker player, based in Malibu, California. He is known for winning the 2006 World Series of Poker (WSOP) Main Event and currently divides his time between his activities as president of production for the entertainment company, Buzznation and poker competition, primarily major tournaments. Gold began his career in the entertainment business at 16 as an intern at the J. Michael Bloom & Associates Talent Agency. He became a talent agent before he was 21, but soon moved into management/production. Gold's clients have included Jimmy Fallon and Lucy Liu.In cable network HBO's Entourage series, Jeremy Piven plays the role of a super agent. The name of his character was originally cast as Jamie Gold, but HBO executives changed it to Ari Gold because of Jamie Gold. Gold's most serious efforts to improve his recreational poker exploits came about when he began working with former WSOP main event winners Johnny Chan and Chris Moneymaker on an upcoming television show, and Chan began to mentor Gold in poker. In 2005, Gold began regularly playing in poker tournaments. 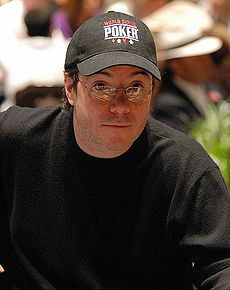 In April 2005 at the Bicycle Casino, he won his first major no limit Texas hold 'em tournament, earning $54,225. Over the next 12 months, Gold had seven more in the money finishes in California tournaments. A neighbor of 2000 WSOP main event winner Chris Ferguson, Gold has said in numerous interviews that Ferguson was one of the few pros to endorse his poker style during the 2006 main event tournament, which he eventually won. While many pros criticized Gold's play in the later stages of the tournament, Ferguson urged him to stick with his own perfected style as he progressed deep into the money. Gold favored pressuring all of the players at the table especially when playing position (last to act in a betting round). Bluff magazine, a major poker trade publication has analyzed Gold’s winning poker strategies as follows: “He forced his tablemates to risk their entire stack time after time. If they reraised him, he either knew they were holding the nuts and folded, or he sniffed out a bluff and forced them all in,” thus "he transformed this strategy into an art form." 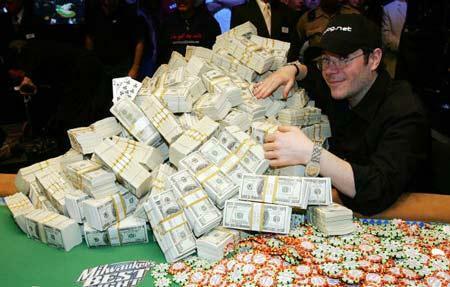 At the 2006 WSOP, Gold maintained a significant chip lead from Day 4 onwards to win the World Series of Poker Main Event (No Limit Texas hold 'em, $10,000 buy-in), outlasting 8,772 other players. Excluding 4th place finisher Allen Cunningham, Gold had more casino tournament final table finishes than the rest of his final table opponents combined. Gold eliminated 7 of his 8 opponents at the final table. Gold defeated Paul Wasicka heads-up, earning a record $12,000,000 when in the final hand his 'Q♠ 9♣' made a pair with the board of 'Q♣ 8♥ 5♥'. Wasicka held '10♥ 10♠' and did not improve with the 'A♦' on the turn and '4♣' on the river. Gold won the event despite earlier saying that he would prefer to finish second as he felt uncomfortable with the idea of being famous. Gold's WSOP win was marked by an uncanny ability to goad his opponents into either calling his bets when he had an unbeatable hand or folding to him when he was weak. He consistently told his opponents that he was weak or strong, telling the truth sometimes, and sometimes lying, with the net result of successfully deceiving his opponents most of the time. Prior to the 2006 WSOP Main Event, Gold had compiled a solid record in tournament competition, using lessons learned from poker legend and previous two time WSOP main event winner and owner of 10 WSOP bracelets, Johnny Chan. Gold's "table talk", was both an asset and a source of criticism for his tendency to tell opponents his actual hand during play, contrary to WSOP rules. In one case at the final table, Gold actually flashed one of his hole cards to an opponent (a face card), creating enough uncertainty that his opponent folded the better hand. However, Gold was never penalized for any rules infraction. Prior to his elimination in the 2007 WSOP, Gold was issued a warning for his tactics.